Festival De El Rosario Tomorrow, Sunday November 22 (courtesy La Paz Gringos) - 9:00 am - 4:00 pm, Location: El Rosario, west of Hwy #1 between La Paz and El Triunfo. Watch for signs at Km 167. The Asociacion de Artes del Mar de Cortez A.C. is announcing the Festival de El Rosario, a new arts and crafts show which will kick off the 2009-2010 season of community events in the east cape area of BCS. The Festival de El Rosario will be held in El Rosario on Sunday, Nov 22 from 9am to 4pm. It will feature the work of local and regional artists, the history of El Rosario dating back to the early 1700s and a celebration of the protected natural environment in the area. Highlights of the day will also include: tours to the Santuario de Cactus and the Hacienda of Cattleman, Manuel de Osio, music, folkloric dances, food and lots of local refreshments. Proceeds from the event will go to support the El Rosario Community Center for the Arts. Border Crossing Fiasco - I have been crossing between the U.S./Mexican border for almost 40 years. I have had my share of trials and tribulations as well as many positive experiences. I have always been able to negotiate my way through sometimes difficult situations, but this last crossing at Otay Mesa was a hastle of significant magnitude. I was loaded with nice quality new x'mas toys and school supplies(including new backpacks) for 50 children. In anticipation of tougher border checks I left price tags on all new merchandise. I had receipts and declared everything, knowing that I would have to pay a significant amount of duty. My declaration made absolutely NO difference to the agents. They were more concerned that I had too many of the same type of item. While negotiating this issue, they looked into a small bag (pillow size) and found used children's clothing. I explained that the clothing was from my granddaughter and destined for my housekeeper's daughter. I was told that used clothing was not allowed into Mexico PERIOD!! After much discussion involving several officials I finally offered to leave the bag at the border. This was not allowed. As a last resort I asked if I could put the clothes in their trash. This too was met with a resounding NO. I had already tried a "financial settlement" (against my principles). I speak Spanish and always remained calm and polite. Absolutely nothing worked and I was redirected back into the U.S. to get rid of the clothing before I would be allowed to proceed back into Mexico. Master Level Exercises Psychocalisthenics®, December 7-11 - Simple exercises/Master benefits. No prerequisites required. Psychocalisthenics combines pranayama, calisthenics and Hatha Yoga in a 15-20 minute workout which produces a flash of vital energy through all of the muscles, organs, glands and tissue resulting in complete revitalization. It is easy to learn. 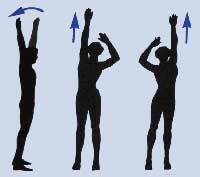 Exercises can be adapted to compensate for any specific body/health concerns that you may have, e.g. knees, backs, necks, etc. The series will be taught over 5 consecutive days. Once learned, you will be able to practice on your own taking 15-20 minutes to complete the series. Master Level Exercise book, videotape, DVD, and practice charts are commercially available: click on “store” at www.arica.org Samples available in class. It's A Peace Wear Christmas - We thought it would be really fun to have a Peace Wear Party the day after Thanksgiving. After all, the best Christmas shopping day is as much of a tradition as turkey and football. Anyway, we went a little crazy and put discount stickers on tons of items -- from 10% to 50% off. WOW! So why not get your shopping done early. There is lots of new inventory such as Crocheted ponchos, purses, shrugs, caplets, wraps, scarfs, hats, caps, berets, (also Rasta hats), sweaters, and even a hot pink bikini top. Also, hand weaving and micro macrame' jewelry with beads. Shawn's latest include: chokers, necklaces, earrings, bracelets. Several of his new fiber art pieces are very wild. And of course we also have a wide assortment of our other items: shawls, scarves, purses, shopping bags, evening bags, etc... and all kinds of jewelry -- necklaces, bracelets, cell charms, earrings (including the beaded Peace Sign Earrings in many, many colors) and of course Love Beads! Iridologist Gloria Shaw Has Returned - Long time Iridologist, Gloria Shaw of Health Naturally has returned. If you are tired of being sick and tired help is only a phone call away. Holistic Health Consultations utilizing Iridology ( the art and science of revealing the pathological, structural, functional and emotional disturbances in the human body. Kinesiology ( specialized parasite, supplement, allergy etc muscle testing. Rife treatments. Violet Ray Chakra balancing and attunement. Specialized Homeopathic / Vibropathic Remedies custom made. Holistic Health Counselling specializing in depression, eating disorders, hormone imbalances etc. Rent a HughesNet Satellite Internet System - If you just need a short-term rental for a few months, we can set up a portable HughesNet Satellite Internet system for you. $300 setup and removal within 20 miles of Todos Santos, $300 security deposit, and $99 per month for the service. Setup and removal at more distant locations will include additional charge for travel time. Call or Email for details. Nov. 19 - 22 - Spay & Neuter Clinic. Volunteers needed, please contact Angelique at bajakitties [-at-] yahoo.com, 14-50250, Todos Santos.